This is a sneak peek at what’s on my frame this week. A hand-stitched double wedding ring, pieced by my Aunt while she was undergoing chemo. 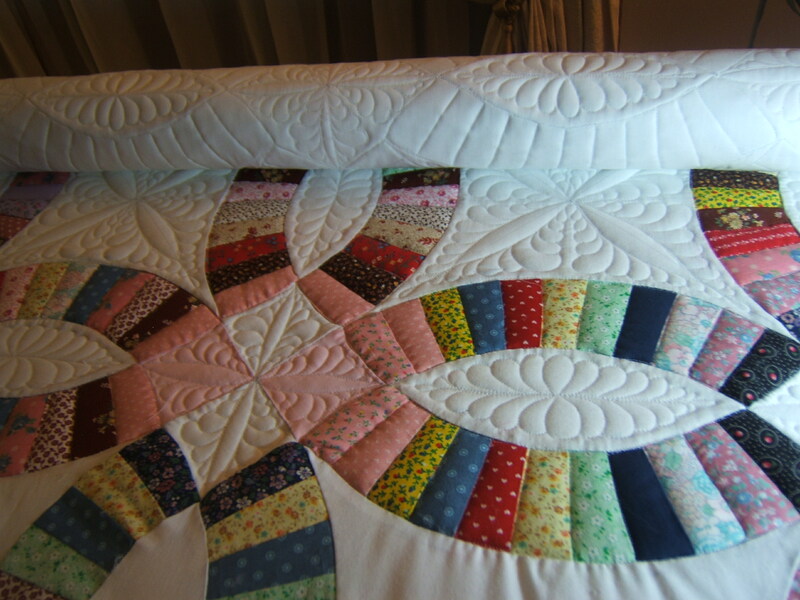 This is a remarkable quilt top – each ring is made up of 11 tiny pieces and I’m stitching each of them in the ditch! Ouch! I’m layering a cotton batting with a poly batting to give it more loft and definition. I love how it looks and feels. I think I’ll beat my record in amount of bobbins used in a quilt, though. I’m just through the 2nd row (out of 5) and I’ve already used 9 bobbins! I’m using Fil-Tec’s Premo Soft (similar in weight/look to SoFine). I like it better than So Fine – I seem to have no breaks whatsoever with this thread. I’ll be ordering more soon for a quilt coming up. It depends on what I’m doing. In this DWR, I used an IttyBitty ruler and used the curved side of it to create the spines of the feathers. In the large white spaces in between the rings, I drew registration lines from corner to corner and vertically and horizontally to give me the placement for the start of the feather spline. I’d use the ruler until I got to the end of it and then freehanded the loop at the end of each spline and then used the ruler to come back to center. I did this for all the splines then freehanded the feathes using the registration markes as guides for where my feathers should end. Where the rings met in the middle, I used the same IttyBitty ruler and just eyeballed it. I also used this same IttyBitty ruler to help guide the SID on the rings. 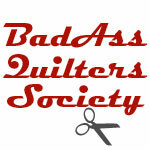 You can find the ruler at http://store.offtheedgequilting.com/ittybitty.html. Someone had recommended it when I bought my first rulers after purchasing my machine and I use it a lot! Thanks LynnEl! I loved this quilt when I saw it on MQR! Thanks for becoming a follower of my blog. I have added you to my dashboard in blogspot, but I don’t know if that shows up for you in wordpress. I look forward to seeing more of your work on your blog.